Ion channels are integral membrane proteins that help establish and control the small voltage gradient across the plasma membrane of living cells by allowing the flow of ions down their electrochemical gradient (1). They are present in the membranes that surround all biological cells because their main function is to regulate the flow of ions across this membrane. Whereas some ion channels permit the passage of ions based on charge, others conduct based on a ionic species, such as sodium or potassium. Furthermore, in some ion channels, the passage is governed by a gate which is controlled by chemical or electrical signals, temperature, or mechanical forces. There are a few main classifications of gated ion channels. There are voltage- gated ion channels, ligandgated, other gating systems and finally those that are classified differently, having more exotic characteristics. The first are voltage- gated ion channels which open and close in response to membrane potential. These are then separated into sodium, calcium, potassium, proton, transient receptor, and cyclic nucleotide-gated channels; each of which is responsible for a unique role. Ligand-gated ion channels are also known as ionotropic receptors, and they open in response to specific ligand molecules binding to the extracellular domain of the receptor protein. The other gated classifications include activation and inactivation by second messengers, inward-rectifier potassium channels, calcium-activated potassium channels, two-pore-domain potassium channels, light-gated channels, mechano-sensitive ion channels and cyclic nucleotide-gated channels. Finally, the other classifications are based on less normal characteristics such as two-pore channels, and transient receptor potential channels (2). Specifically, Cav3.2 is a protein which in humans is encoded by the CACNA1H gene. Studies suggest certain mutations in this gene lead to childhood absence epilepsy (3, 4). Studies also suggest that the up-regulations of Cav3.2 may participate in the progression of prostate cancer toward an androgen-independent stage (5). 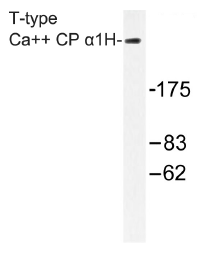 Western blot (WB) analysis of T-type Ca++ CP α1H antibody (Cat.-No AP01505PU-N) in extracts from A549 cells. Western blot analysis of extracts from A549 cells, using CACNA1H Antibody. The lane on the right is treated with the synthesized peptide. 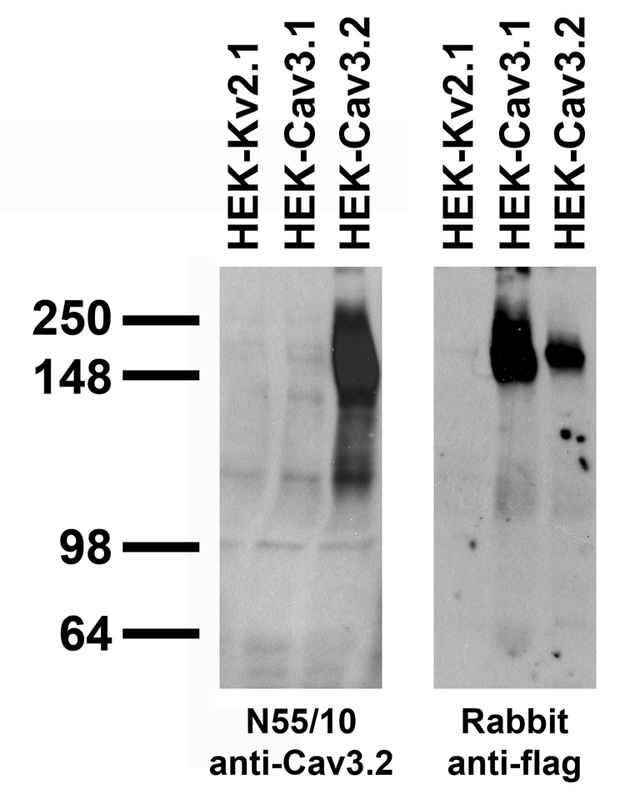 Stable cell immunoblot: extracts of HEK cells stably-expressing Flag-tagged Cav3.2, Cav3.1 or untagged Kv2.1 plasmid and probed with N55/10 TC supe (left) or Rabbit anti-Flag (right). Immunohistochemistry of coronal brain sections from WT and Cav3.2 KO mice. Reproduced with permission from Mala Shah (University College London, England, UK) and Nature Neuroscience(2011 Huang et al, PMID 21358644). IHC analysis of Cav3.2 in frozen sections of mouse brain extract using TA309309. Western blot analysis of extracts from A549 cells, using CACNA1H antibody.The lane on the right is treated with the synthesized peptide. Western blot analysis of rat DRG lysates: 1. 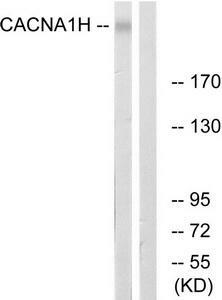 Anti-Cav3.2 antibody, (1:200). 2. Anti-Cav3.2 antibody, preincubated with the control peptide antigen. Expression of Cav3.2 in mouse cerebellum. Immunohistochemical staining of mouse cerebellum frozen sections with Anti-Cav3.2 antibody, (1:100). A. Cav3.2 appears adjacent to Purkinje cells and in fibers in the molecular layer (red). B. Staining of Purkinje cells with mouse anti-parvalbumin (PV, green). C. Merged image of panels A and B demonstrates presence of Cav3.2 adjacent to Purkinje cells. Expression of CaV3.2 in rat DRG. Immunohistochemical staining of rat dorsal root ganglion (DRG) frozen sections with Anti-CaV3.2 antibody, (1:50). Staining is specific for DRG. Note that neither glial cells nor axonal fibers are stained. 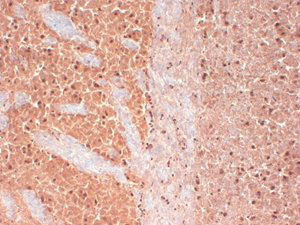 Hoechst 33342 is used as the counterstain. 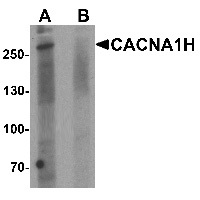 Western blot analysis of CACNA1H in 293 cell lysate with CACNA1H antibody at 1 ug/mL in (A) the absence and (B) the presence of blocking peptide. 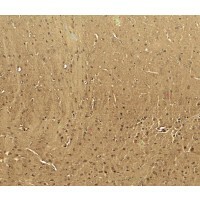 Immunohistochemistry of CACNA1H in mouse brain tissue with CACNA1H antibody at 5 ug/mL. 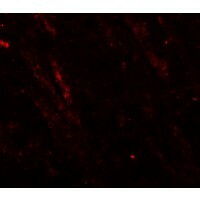 Immunofluorescence of CACNA1H in mouse brain tissue with CACNA1H antibody at 20 ug/mL.